Most of us think of our homes and cars as separate entities: each requiring its own source of fuel or electricity and relying on a centralized power grid that is also relatively inefficient, losing a significant amount of energy due to the transmission of electricity over long distances. But researchers at US Department of Energy’s Oak Ridge National Laboratory (ORNL) are demonstrating that tomorrow’s homes may become self-sustaining systems, generating their own electricity, and sharing this energy wirelessly with the cars that we drive, and using algorithms to control this bi-directional flow of energy between house and car. 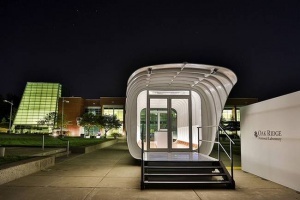 In collaboration with American architecture firm SOM and students from the University of Tennessee, ORNL researchers recently unveiled AMIE 1.0 (Additive Manufacturing Integrated Energy), a 3D-printed, solar-powered home that comes with its own 3D-printed car. 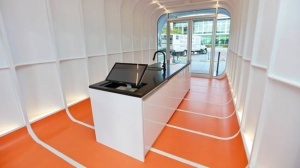 Additive manufacturing was chosen for quick prototyping and as a way to reduce construction waste, which constitutes a significant percentage of materials that are landfilled each year. Regarding energy, both car and house are linked up in through an “integrated energy” approach, utilizing algorithms to determine how energy will wirelessly transferred and stored between the two. The system is also programmed to anticipate when power is available from the sun, and to automatically adapt electrical distribution between the building and the car. These algorithms subsequently determine how to shift building loads (such as the heating, ventilation, and air-conditioning system (HVAC) and provide the remaining energy needs with an optimal balance of power generation from the vehicle and from the electric grid The brain also coordinates with the algorithms in the end devices, such as the car and the HVAC, to ensure optimized power use in the individual components of AMIE. 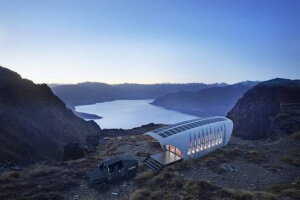 AMIE 1.0 sports a futuristic shell and part of a new genre of housing called micro-homes. Typically measuring less than 500 square feet, these small homes are characterized as more sustainable than your regular suburban home because they take up a relatively small footprint, encouraging its occupants to accumulate less clutter and costing substantially less to maintain. 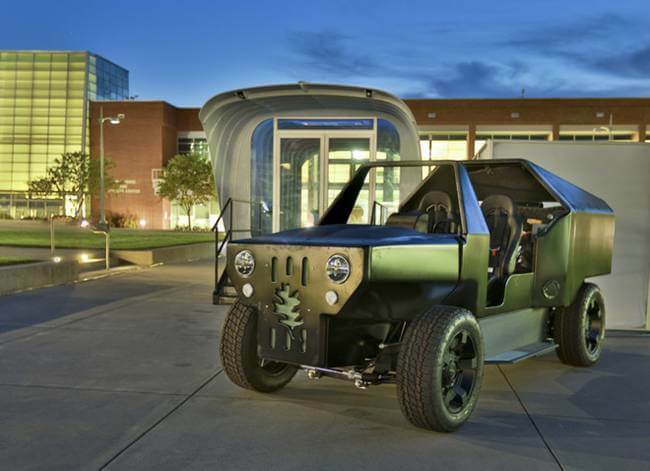 AMIE’s 3D printed car is a hybrid that runs on natural gas and electricity. When not being driven, it can be parked on an inductive charging pad that allows it to transmit or receive energy from the solar-powered home, while surplus electricity can be stored in a battery. While the AMIE system can run off the grid, the home can also tap into the central grid and thus can be powered even on overcast days. It’s the underlying computer algorithms permit this seamless, symbiosis of energy between house and car — and in the larger picture, larger groups of these micro-homes could be organized in distributed microgrid, rather than in a conventional, centralized electrical network. The group simulated an optimal energy management system for AMIE and are developing extensive models of distributed generation unit, HVAC load, energy storage system, and solar PV. The central controller ( the “brain”) uses the mathematical model of each component of AMIE, parameter settings, external information, and user preferences, to generate the optimal operating decisions for all components over the scheduling horizon. The device database includes all technical characteristics of components such as rated power/energy, storage/production level, and external information includes weather and forecast, solar radiation and demand forecasts. While the primary goal was not focused on developing artificial intelligence for this innovative energy management system, the team says that there is some AI built in under the hood. They utilize neural networks for photovoltaic forecasting, Markov chains for predicting the behavior of occupants, and neural networks for tuning the building envelopes for the optimization parameters. The team is now investigating different kinds of powertrains for the car and how to make a more lightweight version, in addition to conducting research on how to integrate AMIE-style homes into a neighborhood microgrid. In the future, the team envisions that the AMIE system of efficiently manufactured and energetically integrated homes can be built any place in the world that doesn’t have an existing power grid, but also in new, more sustainable and resilient neighborhoods in the United States. The research team goes even further, foreseeing that we can someday look forward to large, urban parking lots that double as car-charging stations, or even as emergency power sources during disasters, thanks to this bi-directional transfer of power. It may sound far-fetched, but recent developments in wireless power transfer show that this kind of system is possible, and could be scaled up to completely transform the way we use our homes and drive our cars.